This article first appeared in The Edge Malaysia Weekly, on November 21-27, 2016. ON the face of it, Malaysia has all the right ingredients for a vibrant e-commerce market. Think about it: Malaysia has a robust telecommunications coverage with high mobile phone and internet penetration rates of 89% last year. We also have a strong and secure payment infrastructure and a well-developed logistic services sector. All these form the backbone of the online commerce industry. What’s more, Malaysia has among the highest median disposable income in Asean, at US$18,350, last year. That is almost triple that of the Philippines and Thailand, at US$6,984 and US$6,677 respectively, and more than three times Indonesia’s US$5,949, brokerage and investment firm CLSA points out. “Generally, B2C (business-to-consumer) online retail takes off when a market hits a certain level of purchasing power and mobile internet penetration. But this has not happened in Malaysia,” says CLSA in its September update on e-commerce in Asean titled e-liftoff 2. The report paints a contrarian picture of the country’s e-commerce growth prospects. It punctuates the enthusiasm over the sector’s implied potential in Malaysia amid all the excitement in Asean. Yet, despite having all the right components in place, Malaysia’s online retail sales per capita and online spend relative to total retail spend were disproportionately low. 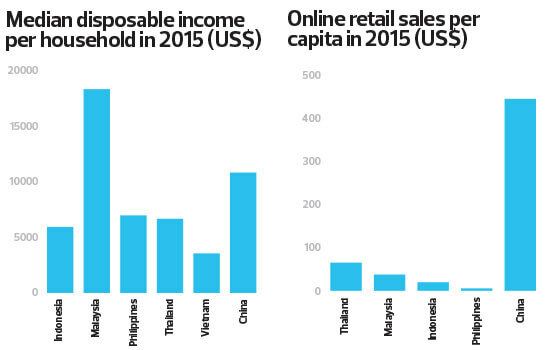 Its online retail sales per capita were a measly US$37.60 last year, which is between Thailand’s (US$65.20) and Indonesia’s (US$19.80), according to CLSA’s data. Malaysia is still a significant laggard compared with China and the US — two of the world’s largest e-commerce markets. Malaysia’s estimated total online retail spend per capita of US$37.60 last year is just 8.5% of China’s US$444.40 and 3.5% of the US’ US$1,062.90. Further, Malaysia’s online retail sales were a mere 2.5% of total retail sales done last year, compared with 10% done in the US and 25% in China. Retail consultants and mall operators acknowledge that e-commerce is definitely a trend that cannot be ignored. Yet, e-commerce has not substantially disrupted offline retail in Malaysia. Retail consultant Richard Chan is among those who do not see e-commerce hurting the business of shopping malls. “There is an impact to a certain extent, but not a major one. What e-commerce does is, it is a catalyst for greater commercial sales, but in terms of shopping centre sales, it has not affected much,” Chan, who is the founder of RCMC Sdn Bhd, says in an interview. In the last 1½ years, Malaysia’s retail sector, on the whole, has been weighed down by weak consumer spending. In fact, Retail Group Malaysia has slashed its retail sales growth projection for this year to 3.5% from 4%. Consumers are holding back on spending, owing to concerns over the rising cost of living, weak ringgit and lacklustre business confidence. There are many factors but e-commerce certainly is not denting offline retail. In fact, more cautious consumers are said to be heading online to find better bargains. So, can Malaysia’s e-commerce potential be written off so quickly? Well, it depends on whether one sees the proverbial glass as being half full or half empty. There are those who believe that Malaysia’s e-commerce market can only grow from a low base. For example, data from Euromonitor and Statistica paints a slightly more optimistic picture than CLSA’s. According to Euromonitor, the country’s online B2C sales stood at RM1.866 billion (US$477 million) last year. Statistica projects that Malaysia’s e-commerce gross revenue will hit US$849 million (excluding shipping changes) this year, with average revenue per user at US$63.93. About 42.5% (US$380 million) of total sales are expected to be from the electronics and media segment. For the next five years, Statistica expects e-commerce in Malaysia to see a compound annual growth rate of 23.7%, to US$2.585 billion in 2021. User penetration, meanwhile, is projected to rise from 61.7% this year to 76.8% in 2021. Like many other data sources, CLSA’s and Statistica’s data on e-commerce captures transactions in the online B2C space, which involves the sales of physical goods via digital channels to end users. This includes online platforms that sell in specific verticals such as fashion, groceries and gadgets. What it does not capture are sales of digital media (music downloads or e-books), B2B transactions (Alibaba), resale of used goods and C2C transactions as there is no comprehensive data on the volume and value of total trade between people done via social media channels or e-commerce platforms. It also may not capture transactions done by Malaysian consumers on overseas platforms like Taobao. The B2C data also does not cover transactions in digitally distributed services such as flight tickets, hotel bookings, movie tickets and e-vouchers. These non-physical goods make up a sizeable portion of online transactions in Malaysia. The focus is on B2C e-commerce, which some believe has the potential to disrupt offline retailers. “When people talk about e-commerce taking over from bricks-and-mortar businesses, they speak like it is inevitable. It is booming in the US, the UK and China, so it must be happening here, too. “Yeah, sure … E-commerce is not going to go away but we cannot just assume that in Malaysia, things are in place for huge growth,” says a venture capital fund manager based in Kuala Lumpur. So, why is Malaysia’s online retail industry still struggling to capture a larger share of total retail spend? There are several key challenges that e-commerce players still face. For one, Malaysia’s population size of about 31 million people means that the addressable market size is small compared with other Asean countries. Malaysia’s population is less than half of Thailand’s (68 million), under a third of the Philippines’ (102 million) and just over 10% of Indonesia’s (261 million). Just on the population numbers alone, which give an indication of long-term growth and earnings potential, Malaysia sure looks unappealing to investors in the e-commerce space. “Limited capital means that there has been less investment in the supporting infrastructure, including traffic acquisition, logistics, payment and mobile e-commerce development. All these tend to hinder the pace of development of the entire e-commerce ecosystem,” CLSA says. Yet, investors in the internet space prefer Indonesia’s and Thailand’s growth prospects in the near term. According to CLSA, even the Philippines looks set to eclipse Malaysia in terms of online retail growth. Significantly, the investment firm notes a deceleration in year-on-year growth in Malaysia for the past two years, from 28.3% in 2013 to a mere 17% and 15% in 2014 and 2015 respectively. Large Asean markets like Indonesia and Thailand, however, have seen acceleration in online retail growth (see chart). Another hurdle for e-commerce players is Malaysia’s high penetration of offline retail, given the abundance of shopping mall space. This means that the convenience and accessibility advantages of e-commerce transactions are not as urgent as in other countries. 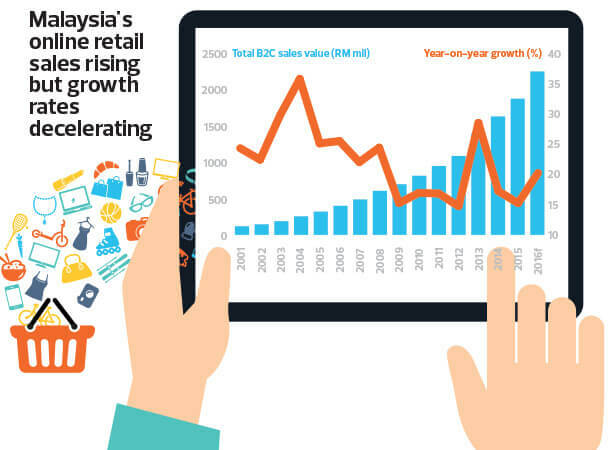 Malaysia’s offline retailers, too, are only slowly coming on board the digital commerce game. Apart from these factors, the vast choices available to consumers online is a key driver of digital sales growth. “Consumers are not going to shop online in large numbers unless there is a sizeable range of choices at attractive prices,” CLSA says. In an earlier e-commerce report, it points out that Malaysia’s e-commerce market suffered from a low number of goods available on online platforms, with relatively small stockkeeping unit (SKU) counts compared with leading e-commerce markets. Nevertheless, in the last one year, local market leaders, namely Lazada and 11street, have aggressively ramped up their SKUs by 1,000% y-o-y to over six million each. Lazada’s SKU count is expected to continue to grow, particularly with Alibaba’s recent acquisition of a controlling stake in the company for US$1 billion. The Chinese internet titan can leverage Lazada’s marketplace to bring in more global and Chinese brands. According to CLSA, the network effect — which is the most important driver of online sales growth — should be evident. “More brands and SKUs attract more traffic and more traffic attracts more brands and merchants, leading to an increased SKU count,” it says. Ultimately, it all boils down to consumer demand — if e-commerce platforms can offer a substantially better range of goods at competitive prices with good user experience and convenience, then consumers may start spending more money and time online. After all, Malaysia has already got the key pieces of the puzzle in place.